Roboze and FDM Digital Solutions have now joined forces to create the Xtreme3DParts network. Xtreme3DParts will be a global network of additive manufacturing centers for the on-demand production of parts made from high-performance polymers for what Roboze calls “extreme applications.” Target industries include the aerospace, automotive, F1 and industrial sectors. Roboze was one of the first companies to make 3D printing with high-performance polymers accessible, starting with the introduction of the desktop Roboze One+400. At formnext this week, the company announced its new Xtreme 3D printer series for the most demanding applications, and this along with the formation of the Xtreme3DParts network suggests that Roboze is shifting its focus toward a vision of 3D printing that is more industrial than ever. 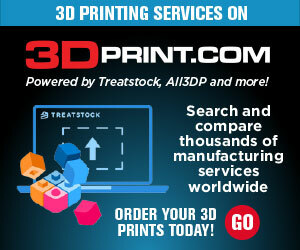 Will other companies follow FDM Digital Solutions in joining the Xtreme3DParts network? More and more companies have been moving toward production-level 3D printing, and Roboze no longer stands alone in offering access to high-performance materials. FDM Digital Solutions has always been at the forefront of advanced 3D printing, being the only UK company to possess an HP Multi Jet Fusion 3D printer, for instance. On the whole, attitudes towards 3D printing have been shifting. It’s being seen less as a method of producing flimsy visual-only prototypes, as polymer materials advance. It’s even evolving past functional prototypes and allowing for the production of actual parts that can hold up in harsh environments like under the hood of a car, for example. Now that such capabilities exist for the technology, more and more companies are wanting in on the trend of what Roboze would call extreme 3D printing. Not all companies are yet producing polymers with such high-performance potential, but many are striving to get there. A network of providers offering access to this kind of 3D printing performance may be incentive to catch up to Roboze and others that have reached the extremes of what 3D printing can offer – and to perhaps offer similar services themselves.